I recently stumbled upon the food blog Half Baked Harvest on Pinterest. The writer Tieghan’s recipes are original and inventive yet manageable for the home chef. Her photographs are gorgeous with pops of juicy color and fresh ingredients. Browse through the recipe box – you will not be disappointed! She has everything from tea oven fried chicken sliders with jalepeno cheddar corn salsa to Rice Krispies Treats pancakes to a cheesy black bean and quinoa taco bake. Last night I made the taco bake for dinner with Chelsey. Each bite was a healthy yet cheesy and comforting amalgam of flavor. I halved the recipe and baked each portion in a soup ramekin rather than one large dish. I also left out a few ingredients (in part due to my absent mind at the grocery store, oops). Heat olive oil in a skillet. Add garlic, onions and peppers. Sauté until tender. Add spices then lime juice and water. Cook for a few more minutes. Stir in the quinoa, black beans, pepper jack cheese and crushed tortilla chips. Mix well until the cheese is melted. Transfer the mixture to the ramekins (make sure they’ve been greased!). Top with mixed cheese and bake for 10-15 minutes until cheese is melted. Serve with a dollop of Greek yogurt, diced avocado, shreds of spinach and tortilla chips. Side Note: Millport Dairy at Union Square’s Greenmarket makes fantastic pepper jack cheese. The Pennsylvania-based farmers make raw milk cheese from their grass-fed pastured-raised cows. The pepper jack has a real kick. It’s even Baalok and Chelsey approved. Astoria Flea & Food just wrapped its third Sunday at Kaufman Astoria Studios. Chelsey, my roommate, and I ventured to the backlot market on its first Sunday. 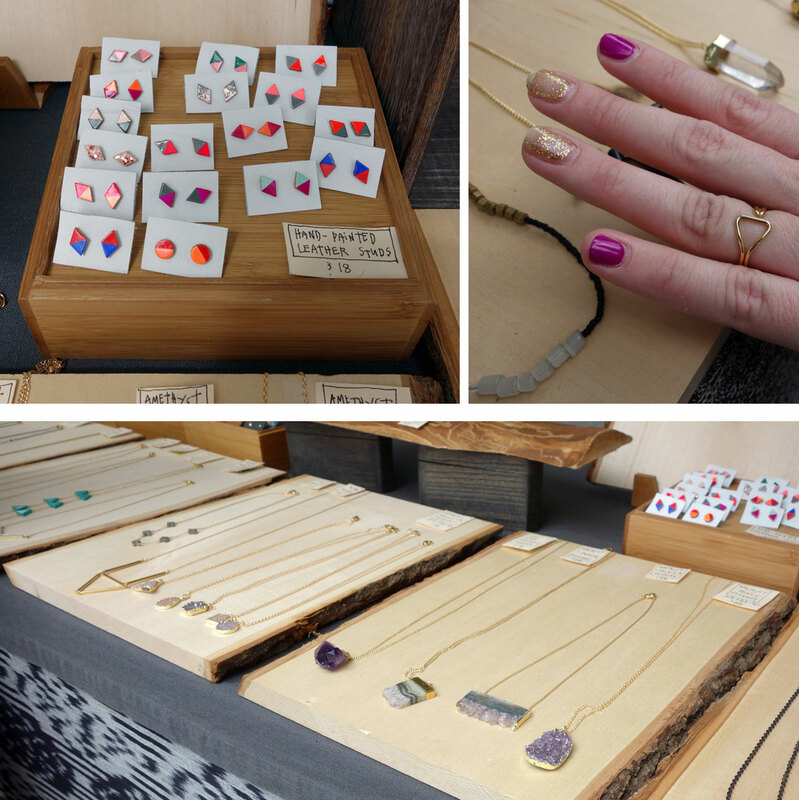 We were thrilled to finally have a flea market in the neighborhood – and in walking distance. We had so much fun browsing the goods. So it’s no surprise that when our dear friend Grace visited, we decided to head over for a bit of local flavor. Where else can you find BBQ sandwiches, plants growing out of tiny corks, dainty vintage plates and gourmet marshmallows under one roof (err, lot)!? We See Stars: This modern jewelry line features geometric shapes with hints of neon and pastels. Grace and I snagged handmade necklaces whereas Chelsey chose a simple gold ring. 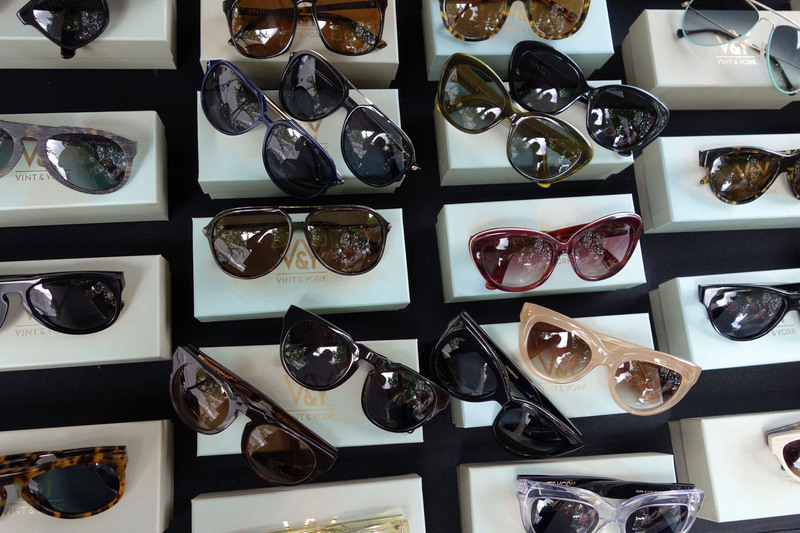 Vint & York: The stylish spec shop recently expanded to sunglasses. I couldn’t resist an oversized pair of aviators. The vendor also included a $25 gift card with the purchase. I’m not sure if they’ll be offering a gift card every Sunday, but it’s worth a try. 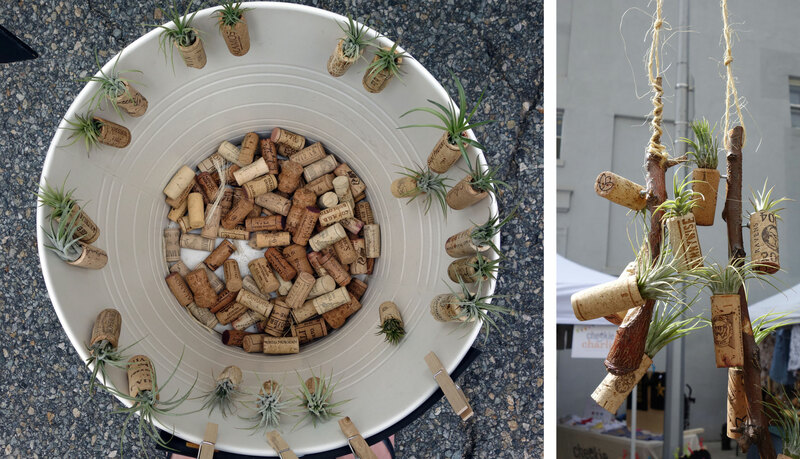 Cork Buds: I’ve already mentioned these baby succulent plants at the LIC Flea. I.just.can’t.resist.the.cuteness. 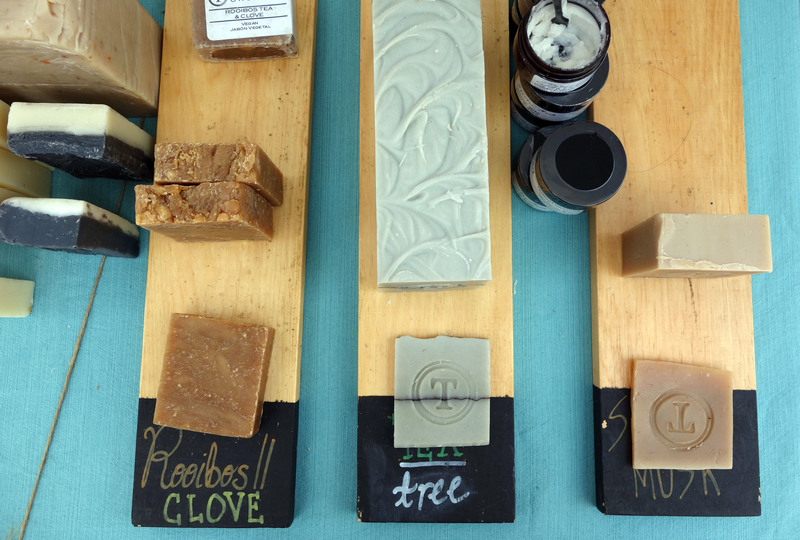 Taproot Organics: Taproot’s rows of sweet-smelling soaps transport you to a sea of lavender or freshly-cut lemongrass. All are handmade and organic. 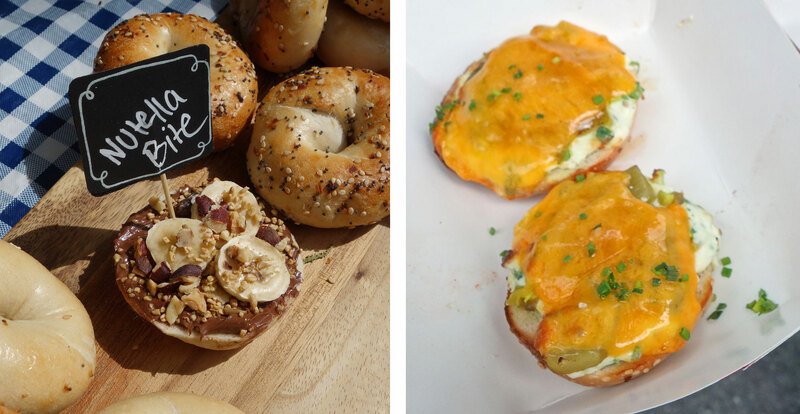 Zito’s Bites: Gourmet bagel bites? Yes, please. Don’t miss the jalapeño bite – the combination of cream cheese, jalapeño slices, green onions and cheddar is seriously amazing. Frittering Away: Seasonal lemonade! 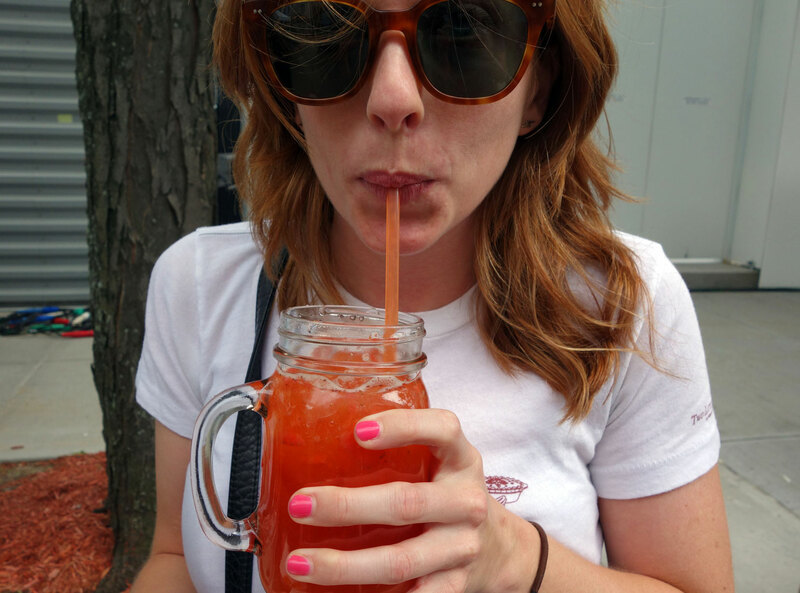 Here’s Grace enjoying a refreshing jar of their strawberry basil. Astoria Flea & Food will be open every Sunday until the end of June. Location: The backlot at Kaufman Astoria Studios, on 36th Street via entry on 34th or 35th Ave. I hoped to post this recipe for the past couple weeks. However, sometimes (many times) life takes precedence over fun in the kitchen. Anyhow, spring is now in full bloom. And for me, the real delights of the season are fresh spring vegetables. Union Square’s Greenmarket is abundant with plump, purple-tipped asparagus, whimsical fiddlehead ferns and ramps, the lead subject of this post. Also known as wild leeks or spring onions, ramps are harvested from the wild and typically appear in markets around early April. Their strong garlic-y, onion-ish odor wafts throughout the market stalls – a delightful scent signaling the official end of winter. Unfortunately, ramps are short lived. The tasty edibles are only available April-May or June. So what’s a simple solution for the fleeting vegetable? Ramp butter! This recipe from Bon Appétit is a simple way to enjoy the treat throughout the summer months. I like it slathered on toast with scrambled eggs or melted on top of grilled vegetables. Side Note: Google ramp butter recipes and you’ll find tons! This one is just my favorite. Other methods add hints of lemon or honey or herbs such as thyme.